The Health Care Financing Administration took its Web users into consideration when it decided to revamp www.Medicare.gov site to improve ease of use and access to health care information. The agency recently unveiled the redesigned site at the annual American Association of Retired Persons convention in Orlando, Fla. The site is served up via Microsoft Internet Information Server 4.0 and SQL Server 6.5 database management system running under Windows NT Server 4.0 on two dual-processor 200-MHz Pentium Pro servers with 256M of RAM per processor, said Andrew Ho, the company's redesign project manager. The site averages 7 million hits and 1.3 million page views per month, HCFA officials said. 'The latest improvements include easier-to-access health-related information,' said Nancy-Ann Min DeParle, HCFA administrator. 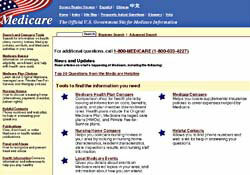 The revamped site at www.medicare.gov provides easier access and more information, HCFA officials said. A team of experts studied the site, looking at things from a user's viewpoint, Lomareozzi said. Because Medicare.gov has official information on Medicare and related issues, many of the site's users are older. Designers had to consider the differences in the way various age groups seek information, Ho and Lomareozzi said. Younger users are more accustomed to using macros and plug-ins, Ho said, and they have grown up using a mouse, so pointing and clicking on a small area of type is no problem. Not so with some older people, he said. Information on the page is displayed in a number of ways to accommodate as many users as possible, Lomareozzi said. The site is designed so that anyone, including those with low-level browsers, can load the page quickly, he said. That factor is especially helpful for users who connect to the Internet via phone lines, DeParle said. The site also touts an upgraded screen reader to let those with vision impairments access the information, she said.